A holiday in Andalucia serves up a traditional taste of Spanish life, complete with historic and cultural attractions well worth visiting. Uncover authentic whitewashed villages, before enjoying water sports, bars and tapas restaurants, then unwind beside the pool of one of our Andalucian villas and watch the gorgeous Mediterranean sun set. Andalucia is located in southern Spain and is divided into eight provinces – Almeria, Cadiz, Cordoba, Granada, Huelva, Jaen, Malaga and Seville. 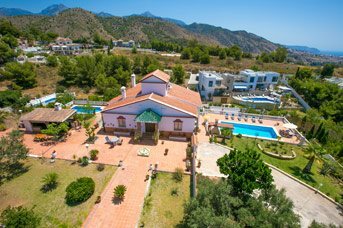 We’ve got villas located in the resorts of Nerja, Torrox Costa and Frigiliana, all perfectly positioned for you to explore the wider area. Andalucia has a typically Mediterranean climate, complete with warm, dry summers and mild winters. Summer is the peak season, when the region is prone to long sunny days and short, pleasantly warm nights. During these months it very rarely rains and temperatures average 28°C – ideal if you’re looking to top up your tan at the beach, or around your own private pool. In September, you can expect more great weather, albeit with fewer crowds, while October’s slightly cooler temperatures (averaging a balmy 24 degrees Celsius) make for great sight-seeing days. Spring is the ideal time if you want to see colourful fauna blossoming, such as that of the National Park of the Sierras de Tejeda. Or during the whole season why not checkout the 18-hole Baviera Golf Club? Whether you’re after laid-back dining in Frigiliana or a livelier evening out in Nerja’s Plaza Tutti Frutti, you’ll find something to love in Andalucia. Lined with numerous bars, central Nerja is perfect if you’re looking to dance the night away in buzzing Spanish bars. Elsewhere, the Torrox Costa promenade offers a wide selection of good eateries for a more low-key evening out. Take your pick of nightlife highlights near your resort, or if you venture a little further out to the bigger cities like Malaga for a day shopping, visit the many restaurants for a bite to eat. The history of Andalucia goes back several millennia and you can visit a number of different heritage sites to explore it in detail. Mankind’s habitation in the area dates to the Upper Palaeolithic period, as shown by human remains found in Nerja Cave, a popular tourist attraction. You can explore Roman sites, including a section of the old road which linked Sexi (Amunecar) with Caviclum (Torrox) and a bridge which provided communications with the Roman town of Detunda (Maro). The Roman remains in the archaeological site near the lighthouse in Torrox make it one of the most valuable sites in the Provence of Malaga. For an insight into the Moors who occupied Andalucia for several centuries in the Middle Ages, visit the Alcazaba castle in Malaga or head up to the world-renowned UNESCO site of the Alhambra in Granada – perfect for a day trip! In 1509, to provide coastal defences against the attacks of Berber pirates, a fortress was built on rocky ground overlooking the sea in Nerja, which is the site of the popular Balcon de Europa today. To learn more about all historical aspects of the region, the Archaeological Museum in Frigiliana is well worth a visit. Holy Week, following Palm Sunday, is perhaps the most moving and dramatic celebration Andalucia has to offer. During the Easter processions, fancifully decorated floats parade through the streets. Come October, the Feria del Nerja is held – an annual celebration made up of various flamenco and musical performances. The popular Caves of Nerja are within driving distance from any of our Andalucian villas. Set in the slopes of the Sierra Almijara Mountains, you’ll find cave paintings over 20,000 years old and huge stalactites hanging from the ceiling. Classical concerts are held here in the summer, too. Ronda, on the other hand, is one of Andalucia’s most popular inland destinations, with its famous deep gorge and historical Old Town. Whilst here get a token photograph looking out over the stunning surrounding valley before returning to the comfort of your villa. The region has a vast selection of restaurants to choose from, ranging from simple beach eateries to other more luxurious dining options. You’ll find both international and Spanish cuisine in Andalucia, with locally sourced fish frequently on the menu – a staple of the famous Mediterranean diet. If you’re having difficulty deciding what to try, get a selection of tasty tapas dishes to share. Get to know Nerja on one of the tourist trains which tootle around – you’ll get to see the best attractions and be able to map out what you want to do for the rest of your holiday in Spain. The Aquavelis Waterpark (Parque Acuatico) in Torre del Mar, offers exciting rides like the Kamikaze, as well as a small-scale mini park for younger children. Water sports fans will find plenty to occupy them, too, including parasailing, jet-ski and banana rides at Nerja’s Burriana Beach. Inland from the beach lies the mountainous National Park of the Sierras de Tejeda, which is easily accessible from other Villa Plus resorts, like Frigiliana, and Torrox Costa. 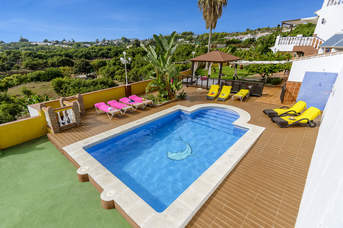 We have villas to rent in Nerja, Frigiliana and Torrox Costa. Each property offers contrasting settings, from beachside rentals to tranquil countryside retreats. Whether you fancy a touch of luxury in a peaceful countryside holiday home, a spectacular sea view or a centrally located villa so you can walk to restaurants and other attractions, we’ve got you covered. Once you’re there, we’ll be on hand 24-7 to make sure you have the getaway you’ve been dreaming of. We live and breathe the destination and want you to love Andalucia just as much as we do. Enjoy a stay in one of our Andalucia villas in Southern Spain, soaking up fabulous resorts like Nerja, Frigiliana and Torrox Costa, not to mention plenty of Mediterranean sunshine. You'll never be too far away from traditional villages, or the coast - the best of both worlds. The picturesque village of Frigiliana is perched on a ridge in the Tejeda mountains, securing it fantastic, scenic views. One of the typical ‘white villages’ of Southern Spain, it has won awards as Andalucia’s Prettiest Village. The river - Rio Higueron - runs through the centre, providing lovely walks and picnic spots - not to metion scenic views. Nerja has remained largely untouched by development and the old town is still a maze of narrow streets and traditional architecture virtually unchanged for centuries. The added bonus is having over 7 miles of nearby beaches to explore. Don’t miss the spectacular Balcon de Europa at the end of a palm-lined promenade where, from its circular viewpoint, you gaze out at the vast panorama of town, coast and mountains. At its heart is the Plaza Tutti Frutti where people enjoy dancing to live music until the early hours. The upmarket town of Torrox Costa in Andalucia is all about the beautiful Blue Flag beaches of El Penoncillo and Ferrara Playa with the resort having around 6 miles of pristine coastline to its name. There’s a choice of places to dine along the promenade and down the little side streets by the beach. Although, today a modern holiday resort, it has an interesting history as it was once the harbour used by the merchants of Granada in the silk trade with Baghdad and Damascus. There are some remnants of Roman settlements here too. There’s plenty to keep you occupied in Andalucia. No villa holiday would be complete without trying out the variety of water sports available on Burriana Beach in Nerja, including kayaking and jet skiing – of course, you can always brush up on your swimming skills by your own private pool. If you prefer to keep your feet on dry land visit the spectacular caves of Nerja, or one of the traditional ‘white’ villages of the Costa del Sol, like Frigiliana, for a true taste of life in Spain. The Balcon de Europa is the focal point of Nerja town, and formerly a fortress designed to keep out British pirates. Today it offers spectacular views up and down the coastline. It’s a hive of activity and completely pedestrianised, as are the adjoining streets and is lined with cafes, restaurants and ice cream parlours. The wonderful Caves of Nerja in Maro Village are one of the most popular tourist attractions in the area. They are set in the slopes of the Sierra Almijara Mountains, and stretch for over 3 miles. Paintings over 20,000 years old, as well as stalactites can be found, whilst classical concerts are held here in the summer. The Chillar River Walk takes you from the beach in Nerja, leading through Sierras de Tejeda, Almijara and the Alhama Natural Park. With crystal clear river pools combined with the shaded canyon, it’s perfect for a hot summer’s day. Frigiliana, located 4 miles from Nerja, is one of the picturesque ‘white’ villages with a maze of cobbled streets and white washed houses. Set on a hillside, there are many viewpoints offering views of the surrounding countryside towards the coast. There are plenty of beaches to choose from across Nerja and Torrox Costa alone, why not visit a different one each day? This is probably the most popular beach in Nerja with every conceivable facility from watersports to children's play areas and volleyball nets. There is something for everyone. Lining the beachfront are traditional Spanish restaurants, while opposite there is a wealth of ice cream parlours, bars and bistros to choose from, some offering live music and flamenco shows. This small, picturesque cove, is located right in the centre of Nerja, dotted with traditional fisherman’s cottages built into the rugged sea-worn rocks. There’s a restaurant on the beach itself as well as easy access to an array of cafes, bars and restaurants in and around the famous Balcon de Europa. Often mistaken as a private beach, this beach is located directly below the Balcon de Europa with access through the Hotel Balcon de Europa or via walkway from the adjacent Calahonda Beach. There are plenty of places to eat and drink a short walk away, some with splendid sea views. Located at the eastern end of Nerja, this beautiful sand and pebble coves is tucked away between Carabeo and Burriana beaches. Less touched by tourism, there are limited facilities and, with 117 steps down, it’s worth taking your own drinks and snacks! There are kiosks, bars and restaurants, at the top or a little further along at Burriana Beach for those feeling energetic. Due to the location and accessibility, this beach so isn’t recommended for people with mobility difficulties or with children in pushchairs. This sheltered sandy cove is located right in the heart of Nerja. There are sunbeds available and a kiosk serving drinks and snacks in high season. A wide selection of shops and eateries are also just a short walk from the resort centre. Just over a mile in length, El Playazo Beach is the longest stretch of sand in Nerja. While relatively underdeveloped, sunbeds are available to hire and there are a handful of reasonably priced chiringuitos (beach bars) scattered along the beach. Located close to the Balcon de Europa, this cosy beach is dotted with traditional fisherman’s cottages built into the rugged sea-worn rocks. Steps zigzag down to the beach and whilst there are no restaurants, there’s a drinks kiosk and the centre of the resort is just a short walk away. Picturesque Nerja is the largest resort east of Malaga with several miles of beaches to explore. A small coastal path leads directly from the town centre past numerous sheltered, sandy coves to the unspoilt main Burriana Beach with sunbeds for hire and several beach bars. This very long and wide beach with calm waters is ideal for leisurely walks or simply sunbathing. Its situated away from apartment buildings and easily accessible from the N340 road. 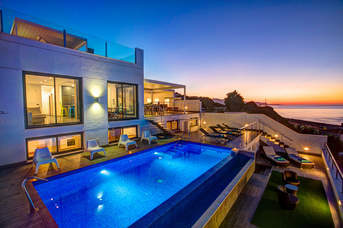 Facilities are limited, although its proximity to resorts like Torrox Costa means plenty of places to eat and drink are just a short drive way. Alternatively, why not pack a picnic? This is probably Nerja's second most popular beach, on the other side of town from Burriana Beach. It has been artificially widened to create a great beach for young children with shallow and generally calm water, and soft sand. Sunbeds and umbrellas can be hired here and there are 2 restaurants on the beach itself as well as several kiosks serving food and drink. Food is an integral part of Andalucian life with plenty of options when eating out ranging from simple yet tasty tapas to fresh fish. Many of the beaches have chiringuitos – beachside restaurants – where you can dine whilst overlooking the sea. You’ll find a range of international cuisine on offer too including Chinese, Italian and Greek – there is something to suit every taste bud. But for a true cultural experience, you must try the typical cuisine including the Andalucian Gazpacho and sweet churros. Markets are a common sight in towns and villages throughout Andalucia. They are colourful, noisy and entertaining – an experience not to be missed. 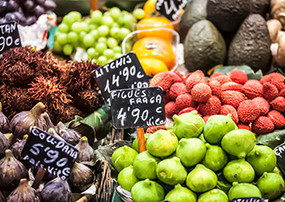 The Tuesday morning market in Nerja is made up of a wide range of stalls selling not only fruit, vegetable and local produce but clothes, shoes and ceramics. Frigiliana's market days are Thursdays and Sundays, which is a great place for picking up local produce and specialities. You’ll also find a market in Torrox Costa on a Monday. Tapas - Tapas are small portions of foods, both hot and cold, often accompanied by Spanish sherry or draught beer. Favourites to sample are gambas al pil pil (prawns sizzled in oil with garlic and chilli), tortilla de patatas (Spanish potato omelette), croquetas (croquettes containing ham, fish or cheese) and remojon (olives and orange salad). Paella - Paella is one of the most iconic dishes from Spain’s gastronomy. The Andalusian Mediterranean paella coloured and subtly flavoured with saffron can be traced back to Moorish times. It’s usually made with seafood, including clams, mussels, calamari, and prawns. There are also versions with chicken and pork, as well as mixed meat and seafood. Seafood - As Nerja is a coastal town fresh fish and seafood are plentiful. From the Mediterranean waters, fishermen bring the daily catch swordfish, tuna, calamari, sardines to local restaurants and bars. 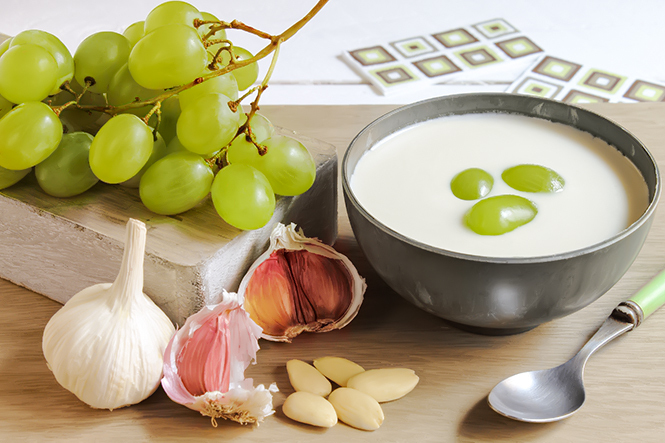 Andalucian Gazpacho - Andalucian Gazpacho is a cold soup made of raw blended vegetables. A classic of Spanish cuisine, it originated in the southern region of Andalusia. Churros - This is a sweet tasty treat and each churro is a dough consisting of flour, water, sugar and salt which is introduced into an apparatus similar to a pastry bag where it is pushed out by extrusion into cylindrical strips the thickness of a finger. They are fried in oil and then, sometimes, coated in sugar or bathed in chocolate. Submerge the breadcrumbs in water until they are soaked, then squeeze the water out. Meanwhile, peel the almonds. Put everything into a mortar and mash it with the garlic cloves until fine. Then add the oil little by little, as if making mayonnaise, until it becomes a paste. Lighten it with water and vinegar until it is a creamy broth. Peel the grapes and remove the seeds. Add them to the broth and season with salt. Ajo blanco is always served very cold.